Have you ever seen a sun dog? I hadn’t until we moved to Iowa, where the winters can be extremely cold. The first time I saw one, probably eight or more years ago, I was driving home after dropping my daughter off at school. Although I’d never seen one before, I immediately knew what it was! Sometime in the past I must have read about them or seen photos, because the minute I saw this strange triple sun in the sky, I thought, “sun dog.” Wow. If you’ve never seen a sun dog, picture the winter sun, low in the sky. Then imagine an arc half-encircling it, sort of like a rainbow but not really visible. Now place another bright sun at each “end” of the arc, and you have a sun dog! 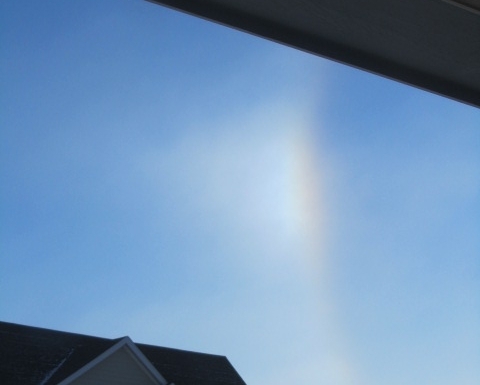 Also called a mock or phantom sun, this event is caused by light refracting off a certain shape of ice crystal in a particular kind of cloud, creating a prism effect (that’s why sometimes the “false suns” are multicolored, like a rainbow, but more muted). When conditions are just right, you can even sort of see the arc or halo around the real sun, but the refractions also look a lot like the sun. I don’t think any of us would confuse a sun dog for the real sun, but if you’d never seen a sun dog before and woke up one winter morning to this strange sight, you might wonder whether something had changed overnight in our solar system (or you might wonder if you’d woken up in a science fiction movie). But you would have known instinctively that the sun in the middle was the real sun, and the others were imposters. Do you think you would ever confuse a false god for the real God? I’ll bet all of us are pretty confident we can tell the difference. But think about what you spend your time and money on, and ask yourself what holds the place of greatest honor in your life. I like to think that I’m a pretty “good” Christian, yet sometimes when I’m lying in bed at night, and my brain is still percolating over ideas, I realize that I have given God hardly a thought all day. How can that be? I am certainly aware of who God is, and I don’t think I would ever confuse some imposter for the real God, but if that’s true then why do I so often give God so little of my time and attention? Sometimes I treat Him more like a faraway friend than my sovereign Lord. When we think about idols, maybe we picture statues or other physical objects. There are lots of stories in the Bible about people worshipping false gods and keeping idols in their homes and temples. But what is an idol, really? When I look up the word on dictionary.com, I find these definitions: “an image of a deity other than God” and “any person or thing regarded with blind admiration, adoration, or devotion.” When I look around my home, I don’t see any images of deities other than God, but I do see a lot of other things that I might regard with devotion, for instance, my book collection. Now, I’m not saying God frowns on recreational reading, but when I neglect His Word to read other books, that’s a problem. When I compare the hours I spend watching TV or working on art projects to the time I spend in prayer and meditation, I start to feel convicted. When my relationship with God gets out of balance, it’s time for me to work on my priorities. God sent a rainbow after the Flood to remind us of His mercy and faithfulness. Maybe He sends sun dogs to remind us of His sovereignty.